Karsten and his team returning to Obenge after third time under gunfire in less than a month. We planned to meet part way. 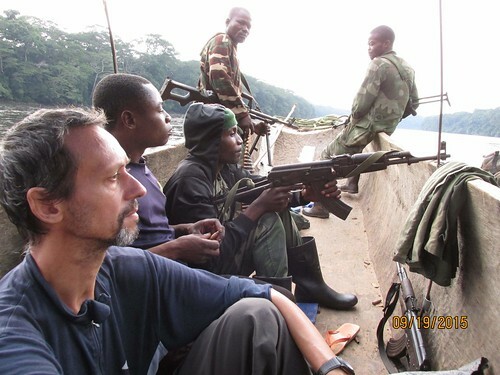 John, Matthieu and myself were to take a dugout moving downstream from Katopa camp. In the meantime, Karsten who now directs activities at the northern Obenge camp would take a dugout upstream. Here’s the plan: First Karsten stops at Biondo. There, he hikes in to collect the first data from the camera trap grid, comes back to Biondo and continues upstream. 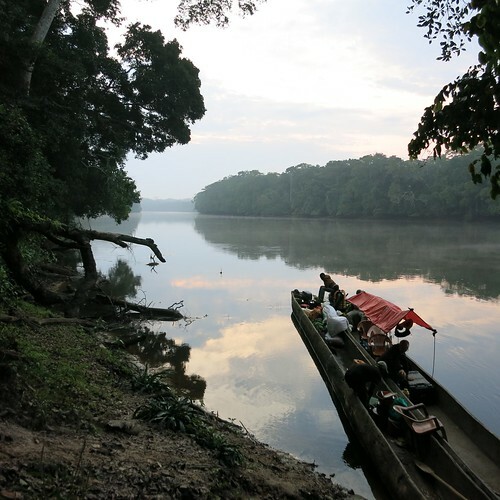 We meet at Lifongo, the river that marks the division between Orientale and Maniema Provinces. Plan was to meet at Lifongo River mouth. We come downstream. Karsten comes upstream. Afterwards we send our Katopa dugout, with Maniema military, back to Katopa. We climb into Karsten’s dugout which has Orientale based military, turn around and continue downstream to Obenge. After a visit at Obenge, John and I will take a dugout further downstream to Opala and then motor-mikes to Kisangani. That was the plan. Karsten started first, on the 5th of September, as he had to stop to at Biondo. 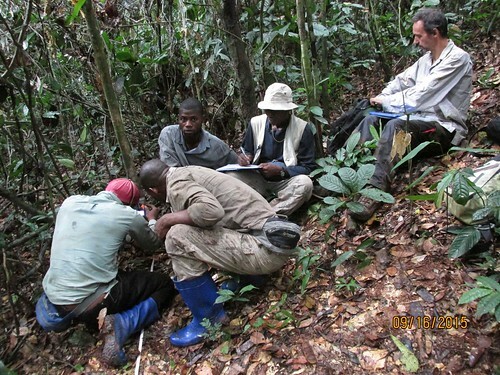 The hike into the E15 camera traps, uploading the data, and hike out would be at least 5 days. 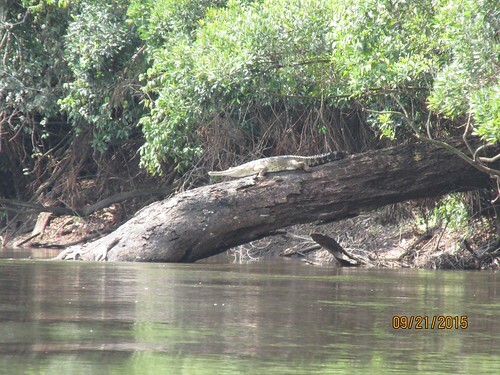 Narrow-snouted crocodile taking stock of Karsten’s passing dugout. Karsten’s team made their first stop at Likaka at 14 hrs (2PM). This was Col Thom’s (elephant poacher and escaped convict) forest camp discovered on the last trip. The first day was maximum tension. The military disembarked and walked towards the camp so the dugout motor would not be heard just in case Thoms’s gang was there. Gunfire as soon as they came out of the forest. Washi saw three men disappear into the trees. There may have been more. By the time the dugout beached the burning was well underway. The TL2 team with the military set fire to Thoms’s Camp Likaka in the middle of the park. Then they continued upstream. This is where the curves in the course of the Lomami do not serve us well. On the same day, three hours later and just a couple of kilometers from the Biondo camp the dugout was under gunfire. The same men as ran off at Likaka? Had they cut forest, using the short path connecting one side of a bend to the other. Who knows what trap might be waiting at Biondo? Karsten and the TL2 team hit the bottom of the dugout. Voices and gunfire come from a wall of trees. First trip aborted, but no one was injured. Karsten’s team did not stop at Biondo. They continued upstream in the dusk. Made a small camp. The next dawn they continued upstream as far as the village of Kakongo. They spent two nights and then returned straight to Obenge to reassess. Five days later, on the 13th of September, they took off again from Obenge arriving at Biondo the same night. They camped and hiked out the next morning to the Camera trap grid. Resetting one of the camera traps after downloading the videos. In the meantime we were at Katopa and the delay had served us well. The Secretary of the Balanga Secteur had come all the way from the village capital of the Balanga at KimiaKimia (see map), to join us in Katopa. We wanted him to see the Balanga villages on the banks of the Lomami, some were ancient, some were brand new and we feared they were all used as camouflage for hunters to poach in the park. The Balanga sector has one road on its far east side– a road accessible only to motorbikes and bicycles. 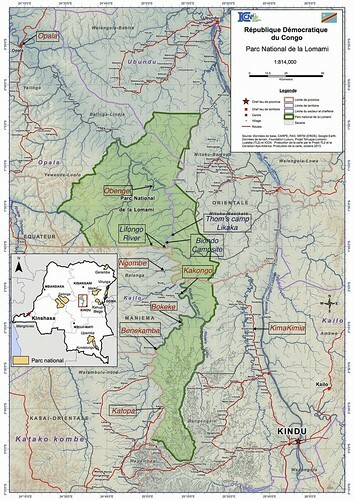 But the Balanga sector is also on the west bank of the Lomami River. This is an important buffer zone of the park where villages are only connected by footpaths. It is also home turf for the criminal, Col Thoms, from the village Ngombe. The secretary, Longoma Beloko, saw our trip as a possibility for him to see what was really happening in his sector. (A sector is an administrative unit like a county, but often established along ethnic lines. The Balanga are an ethnic group). We left on the 18th of September. Our first stop was BeneKamba, ancient village on the Lomami river, way-station for Ivory and slaves during the Arab era and for Ivory and miserably-paid labor during the early Belgian era. The children and the men were the first to gather at Benekamba. Women came later. 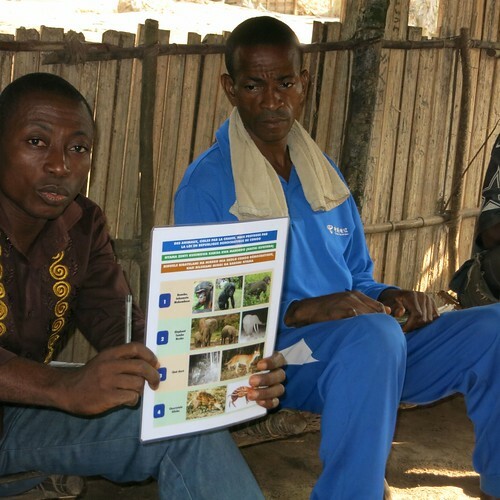 The Secretary gathered the villagers, his fellow Balanga, and told them not to hunt in the park and never to hunt Bonobo or Elephant anywhere. He said that Benekamba would become an endpoint for one of two official foot passages across the Park. The village would be responsible for helping to monitor the loads that left BeneKamba that would again be checked on the other side of the park. We camped the night in an empty fishing camp on the banks of the Lomami. The next day we reached Bokeke a brand new village. Although we were still in the Balanga Sector there were no Balanga in the village. It was a group migrating from another Province; they were Djonga (ethnic group). We all strongly suspected the agricultural activity to be a cover for poaching in the park. The village had not been initiated through normal procedure; the sector had no record of its existence. 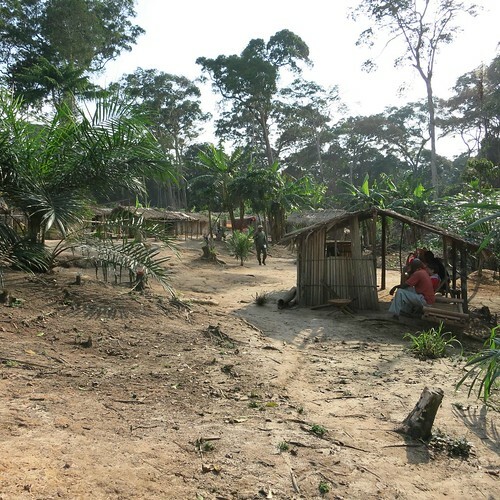 The new village, Bokeke, on the Lomami River. The Secretary Beloko warning about totally protected species. Next to him the a local chief (chef de groupement) who also accompanied us. These stops delayed us. We sent a thuraya message to Karsten saying we would not reach Lifongo on the evening of the 19th as planned but would spend the night in Kakongo and arrive the next day. The village had a least two 12 calibre shotguns. We suspected for hunting in the park. In the meantime Karsten had arrived back in Biondo camp on the 18th and continued on to Lifongo that same day. The second meeting at Lifongo was also aborted. 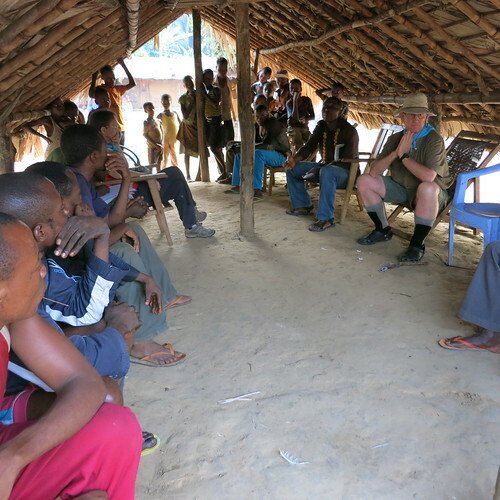 Best option: John, Matthieu, the secretary Beloko and I walked 46km east to the village of Bafundo and our dugout returned upstream to Katopa camp. A week and a half later we met up with Karsten and got the full story. 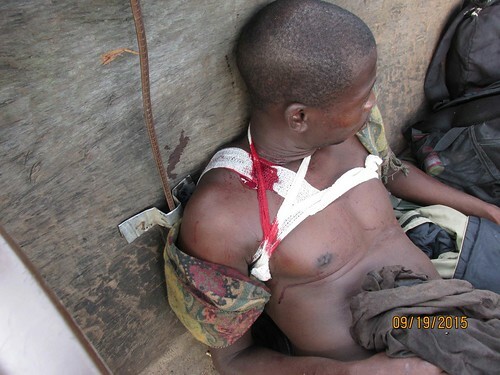 Zagbala, the wounded military, in the dugout heading back to Obenge. What happened: From the prow of the dugout the deckhand, Fidel, who usually marked the depth of the river saw a dugout coming around a bend upstream. The dugout turned around and disappeared. After brief consultation the decision was to follow it. Probably whoever it was, they were scared. Probably it was Balanga fishermen who might have fresh fish to sell. “Turn around” “Turn around” he yelled to the coxswain. Too late. Gun fire from both banks. The Military returned fire. But Zagbala, a military, was hit. No anesthesia back in Obenge. But plenty of hands-on to help. Alfonse, one of our staff at Obenge, is also a nurse and he gave first aid in the dugout and again back in Obenge. Zagbala slept OK the second night. And Karsten accompanied him to Kisangani. A bullet wound to the flesh, no bones affected. Alfonse inserts a serum drip. 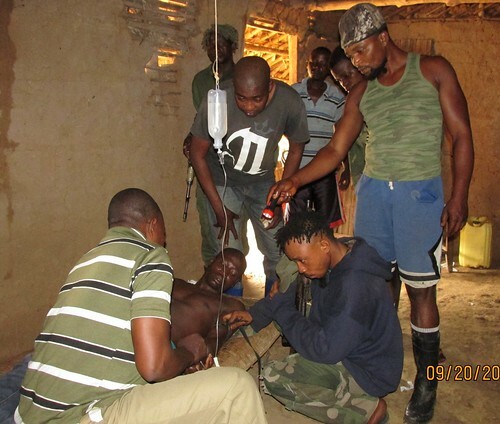 Follow-up: What we found out in Kakongo is that Col Thoms had returned to his natal Balanga village of Ngombe for supplies. He returned to the forest with some new recruits. It was his dugout at the Lifongo bend. There are now two military operations underway. 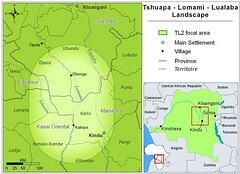 One in Orientale in the forest around Thoms’s bases there, and one in Maniema moving towards his natal village to cut off the supply route. Will there be success? It is a huge forest to hide in, the weak point is that Col Thoms has to have enough food for him and his gang. Will there be a favorable end to this story soon? We will keep updates coming. 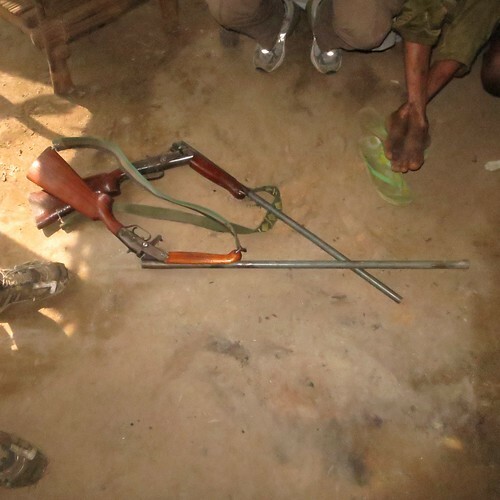 This entry was written by Terese Hart, posted on 2015-10-04 at 8:25 pm, filed under community conservation, Law and Order, Lomami River. Bookmark the permalink. Follow any comments here with the RSS feed for this post. Trackbacks are closed, but you can post a comment.